The Triumph TR7 emerged from the most tumultuous period in the history of the British auto industry — the last and most controversial of a long line of Triumph sports cars. In this installment of Ate Up With Motor, we examine the tangled history of the 1975-1981 Triumph TR7; its V8-powered sibling, the short-lived Triumph TR8; and Triumph itself. Although it is most known as a British carmaker and motorcycle manufacturer, Triumph was originally founded by a German immigrant, Nuremberg-born Siegfried Bettmann, as a reseller of imported bicycles and sewing machines. The firm was initially called the S. Bettmann & Co. Import Agency, but in 1886, Bettmann adopted the trade name Triumph and the company subsequently became the Triumph Cycle Co. Ltd. By the 1890s, Triumph was manufacturing its own bicycles in a factory in Coventry. Triumph offered its first motorcycle in 1902 and its first three-wheeler in 1903, but four-wheeled passenger cars didn’t follow until April 1923, about two years after Bettmann bought out the defunct Dawson Car Company works on Clay Lane in Stoke Heath, a northeastern suburb of Coventry. By the 1930s, the Triumph Motor Co. Ltd. (as it had been registered since 1930) offered a variety of upscale four- and six-cylinder models, even dabbling briefly with an eight-cylinder sports car, the Dolomite, designed by experimental engineer Donald Healey. Despite its proliferation of products, however, Triumph’s volume was never large — total prewar production amounted to fewer than 50,000 units — and the Depression made slow sellers of expensive cars like the 16 HP Gloria Six, whose price would buy three Ford Model Y saloons. The sale of the cycle business in 1936 provided only limited relief and by the summer of 1939, Triumph was in receivership. That September, it was purchased by Thomas W. Ward Ltd., a steel-making firm, but the outbreak of war stymied plans to resume production under the management of Donald Healey. Triumph’s Gloria Lane factory was sold to the government while the original Clay Lane works were leased to Armstrong Whitworth for the manufacture of military aircraft. The latter was decimated by the Luftwaffe in November 1940 and there was little left by the time the Standard Motor Company purchased the Triumph name and remaining assets in 1944. The first Standard-built Triumphs were the razor-edged 1800 Town and Country saloon and 1800 Roadster, both launched in early 1946. The Roadster, designed by Standard’s Frank Callaby, had a wood-framed aluminum body on a tubular steel chassis, independent front suspension, and a 1,776 cc (108 cu. in.) OHV four with 63 horsepower (47 kW). The initial postwar Triumphs, now built at the Standard works in Canley/Fletchamstead, a southwestern suburb of Coventry, were wholly unrelated to their prewar predecessors and used Standard engines and running gear. The early postwar cars were fairly expensive, aimed at the Jaguar 1½-Litre (which used the same engine), but they were supplemented from 1949 by the tiny and much cheaper Mayflower sedan, developed for a vain assault on the American market. By 1950, Standard managing director Sir John Black was keen to add an MG-style sports car to the line. After a failed attempt to buy Morgan, Standard-Triumph developed its own in-house design, the Triumph TR2. Introduced in Geneva in early 1953, the TR2 was an eccentric-looking but rugged roadster powered by a well-massaged version of Standard’s big four. The TR2 was somewhat more expensive than an MG TF, but a good deal faster, capable of perhaps 103 mph (165 km/h) in stock form. With muscular performance and a reasonable price, the TR2 and its TR3 and TR3A successors found many fans in the U.K. and abroad. Nonetheless, by 1960, Standard-Triumph’s finances were shaky, overextended by new model development costs and recent expansions, including additional assembly facilities in Canley and a new factory in Speke, in southeastern Liverpool. A sudden drop in export sales forced massive layoffs and production cuts, so in December, the board agreed to a merger with a better-funded partner: truck and bus manufacturer Leyland Motors. 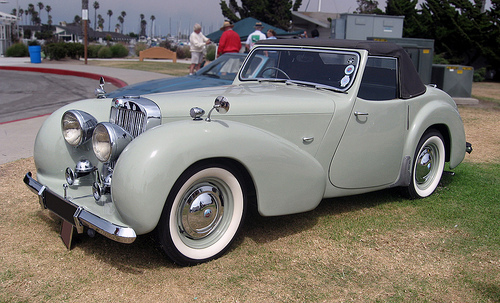 The merger was initially quite cordial, but as Standard-Triumph’s losses continued to mount, the new owners began to exert greater control. In August 1961, Leyland sacked hundreds of Standard-Triumph’s senior executives and replaced them with Leyland people like Donald Stokes, who would be appointed Standard-Triumph managing director in 1963. The facelifted TR3 replaced the TR2 in August 1953, sporting a new grille and other minor changes. 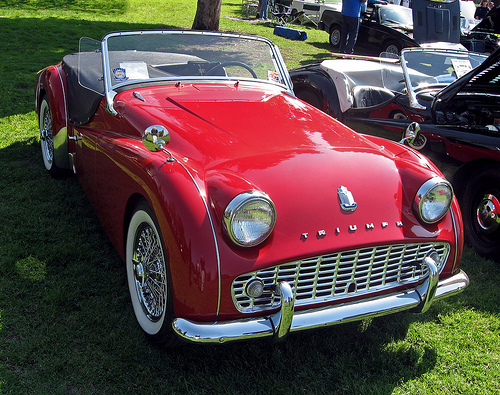 This is a Triumph TR3A, which superseded the TR3 in the fall of 1957. It can be distinguished from the earlier car by its wider grille and external door handles. Like late TR3s, it had standard Girling front disc brakes and a 1,991 cc (122 cu. in.) four with 100 hp (75 kW). Under Leyland management, Standard-Triumph abandoned the Standard marque and introduced a range of new Triumph models, including the compact Herald and Vitesse, the Herald-based Spitfire roadster, the 2000 executive saloon, and the front-wheel-drive 1300, all developed by Triumph chief engineer Harry Webster and designed by Turin’s Giovanni Michelotti. Leyland further bolstered its passenger car offerings with the acquisition of Rover in 1967. Although the 2000 and Rover P6 were direct rivals, Triumph and Rover each had models and expertise the other did not and together commanded a respectable 10.6% of the British market. 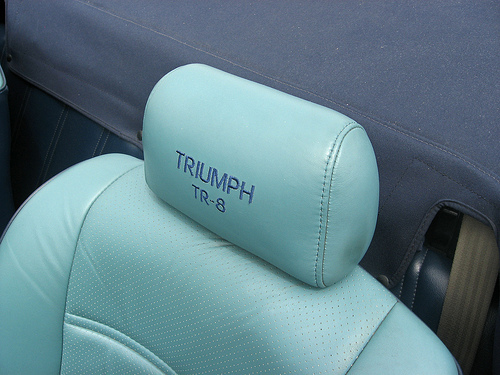 Leyland also had ambitious plans to boost Triumph production to as many as 200,000 units per year. By the autumn of 1967, an additional merger was in the works. The Wilson government was pushing for a consolidation of Leyland and British Motor Holdings, which included BMC (Austin/Morris/MG/Riley/Wolseley) and Jaguar. The merger was completed in the spring of 1968, with Donald Stokes becoming chairman of the new British Leyland Motor Corporation. Triumph managing director George Turnball was reassigned to run the new Volume Car and Light Commercial Division (Austin-Morris), with Harry Webster replacing Alec Issigonis as Austin-Morris chief engineer. Triumph, meanwhile, was grouped with Rover and Jaguar in a new Specialty Division, with Cliff Swindle replacing Turnball as managing director and Rover’s Spen King succeeding Harry Webster as technical director. Although most American readers will be more familiar with Triumph’s sports cars, the company’s other models were its bread and butter in the home market. 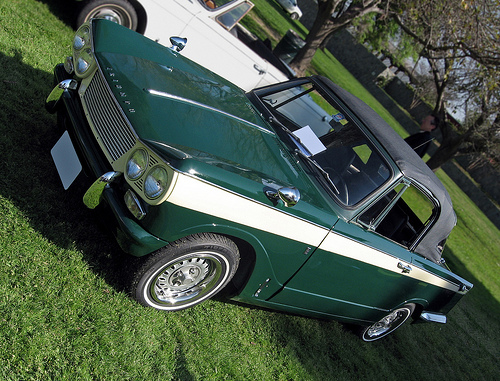 This is a 1968 Triumph Vitesse 2-litre Mk 2, a plusher six-cylinder version of the compact Herald that traded the Herald’s four-cylinder engine for the 1,998 cc (122 cu. in.) six from the 2000 saloon. Some earlier Vitesse 1600 and Mk 1 2-litres were exported to the U.S. (as the Triumph Sports Six), but not the 1968-1971 Mk 2, which had more power and an improved rear suspension borrowed from the GT6 Mk 2/GT6+. Among the pressing issues for the new administration was determining the direction of Triumph’s new model development. While the saloons did well in the U.K., the company’s export business depended heavily on the sports cars, which by the late sixties included the popular four-cylinder Spitfire, the six-cylinder GT6 coupe, and the ‘big’ TR roadster. With the exception of the Michelotti-styled, V8-powered Stag, which was then in development for a 1970 debut, all of these models were becoming a bit gray at the temples. Even the new TR6, introduced in January 1969, was essentially a Karmann facelift of the TR5/TR250, itself a six-cylinder make-over of the 1961-vintage TR4. Their future was further complicated by emerging U.S. regulations, which the older models could not easily meet. By the time the TR6 debuted, Triumph was working on two all-new sports car models, codenamed “Bullet” and “Lynx.” The Bullet, designed by Triumph styling chief Les Moore, was a roadster intended to replace the TR6; prototypes were tested with both four- and six-cylinder engines. The Lynx, designed by Les Moore and Michelotti, was a hatchback coupe with a fastback roofline and a Kamm tail, looking a bit like a foreshortened Lamborghini Espada. The Lynx was intended to succeed the GT6, but it would have been somewhat larger, providing room for 2+2 seating. Both cars were to have considerable structural commonality with one another and would likely have shared most of their running gear. 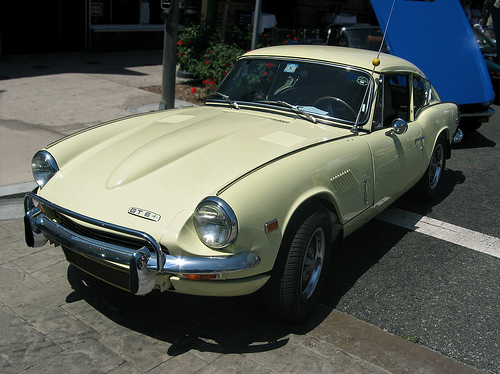 The Triumph GT6 was essentially a fixed-head version of the Spitfire powered by the 1,998 cc (122 cu. in.) six from the Vitesse 2-litre and 2000 saloons. With a modest 95 gross horsepower (71 kW) in federalized form, the GT6 wasn’t quite a muscle car, although it was quicker than the Spitfire. Early cars shared the roadster’s swing-axle rear suspension, but Mark 2 cars (known as GT6+ in the States) had a revised layout that used the transverse leaf spring as an upper control arm, adding additional lower wishbones to avoid the swing axle’s radical camber changes and jacking effect. Late Mark 3 cars reverted to the rear suspension layout of the Mark 4 Spitfire, probably for cost reasons. In the wake of the merger, there was a new possibility to consider: the prospect of rationalizing the separate (and ferociously competitive) sports car offerings of Triumph and MG. In retrospect, that notion seems misguided — even the later use of Triumph engines and gearboxes in the Mk 4 Midget provoked outrage from the MG Faithful — but from a financial standpoint, an integration of the two lines appeared eminently reasonable. The sports cars represented a small percentage of British Leyland’s total production and the costs of developing all-new models that would meet U.S. safety and emissions standards would undoubtedly be very high. Leyland management canceled development of the Lynx in 1969, but directed Triumph to continue work on the Bullet as a potential replacement for both the TR6 and the MGB. Around the same time, MG engineers in Abingdon were asked to develop a smaller, mid-engine car, codenamed ADO21, to succeed the MG Midget, Austin-Healey Sprite, and Spitfire. Developed by Harris Mann and Peter Hughes of the Austin-Morris studio in Longbridge, the ADO21 emerged as a low-slung, wedge-shaped coupe with ‘flying buttress’ sail panels, probably influenced by the Zanda concept car Mann’s team had developed for the 1969 London Motor Show. The ADO21 was designed to accommodate either the 1,275 cc (78 cu. in.) four from the Mini Cooper S or four- and six-cylinder versions of the newer E-series engine. I enjoy your articles. Please note that of the 2 spellings you have used, “Herald” is correct, as in “one who brings news”. “Harold” is incorrect. My sister had one in the Bahamas and it was notable for its “backbone” frame with outriggers to support the body. Not very rigid but no small British cars were at the time and the Herald wasn’t the worst. Eek — how embarrassing. The perils of putting something up late at night. I’ve fixed that…thanks! The text of the initial Triumph article appears to be cut off on the right side. I had a silver 1979/80 TR7 convertable with the red Tartan interior like the picture on page 3. The red carpet did indeed fade to orange then yellow after only a few days worth of parking at the beach (northern CA) with the top down. Pretty pathetic but representative overall of the materials and workmanship of the whole car. I bought it new thinking with proper care and maintenance, it would be a decent ride. In 26K miles over 2 years it went through 3 head gaskets, the ignition system, brakes, clutch and pretty much any seal that came into contact with any liquid – oil, coolant etc. When it did run it was fun to drive, especially up and down the coast highway. Such extravagances were usually punished by a trip to the dealer for more $$$ of repairs. About the only good thing about it was that it was a chick magnet. One chick picked me up and dropped me off at the repair shop often enough eventually married me – probably out of sheer pity. Drove my TR-7 Victory Edition almost 100,000 miles with no problems, and often drove at 90 mph on Louisiana highways for extended periods. Guess I was lucky, but the car was great, except the paint did fade.